If football fans in Los Angeles thought they were getting an actual NFL team whose number one priority is winning, they thought wrong. On Wednesday the E! network announced they had greenlighted a new reality series called Hollywood & Football that will follow six Rams players and their families as they make the transition from life in St. Louis to life in Los Angeles. Yes, that’s in addition to HBO’s Hard Knocks, which will also follow the Rams’ move from St. Louis to Los Angeles. 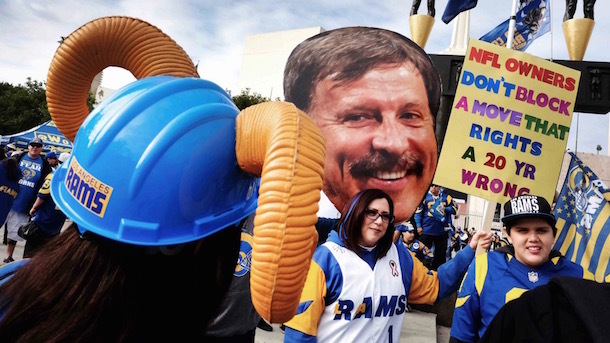 The Rams are now the Kardashians of the NFL. Taking part in the series are Kenny Britt and his wife Sabrina, Roger Saffold and his wife Asia, Lance Kendricks and his wife Danielle, Chase Reynolds and his wife Kalia, Corey Harkey and his wife Bianca, and Bradley Marquez and his fiancée Melissa Hernandez. The show is scheduled to premiere this fall, though there is no official release date just yet. Hopefully none of those guys gets cut before then.